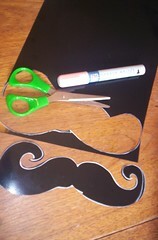 Craftster Community > JEWELRY AND TRINKETS > Trinkets and Jewelry: Completed Projects: General (Moderators: I Sew Cute, Mistress Jennie) > Rockin' the 'stache; for Mustache lovers one and all! 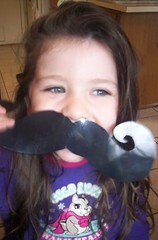 Rockin' the 'stache; for Mustache lovers one and all! 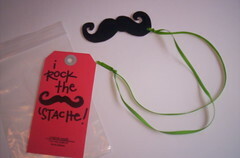 In the meantime, what's better than a big funky moustache, always at hand, in the form of a necklace? See, it's a moustache, disguised as a necklace, to disguise your face! Decorate with sharpies, colored pencils or paintpens (my choice). I only colored it on one side, so it has a brown side and a black side! Let it cool, then try it on for size! 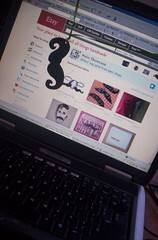 Then, make a mustache treasury on Etsy, and roar hysterically when it makes the front page! Tie on a ribbon, chain, etc. to make it a necklace! I used lime green ribbon. Seriously, the easiest, cheapest, and funniest gift you can give ALL season! 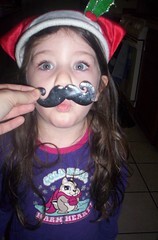 Now, go make one and ROCK your 'STACHE! 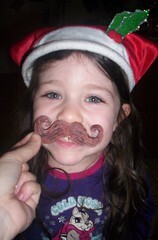 Re: Rockin' the 'stache; for Mustache lovers one and all! This is hilarious! Great project! I love these! 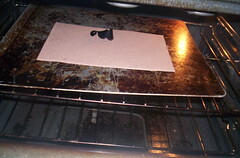 Where did you find black shrink plastic, though? Glad you guys are amused. I'm into making/buying as many handmade gifts as possible this year, and this is one of my fave things I've made so far. Super ridiculous and super AWESOME at the same time. I think I got a 'value' pack that had a variety. It's NOT ShrinkyDink Brand, it was an off-brand. I think I got it at Michaesls? Can't remember, sorry. Thanks for the added info. Maybe on my way home from work tomorrow (once I shovel myself out from all of the snow that dumped on me overnight ), I'll swing by Michael's and have a peek. These are just too fun to ignore!! a friend of mine has a septum piercing, and wears somehing like this in it often. good times. It's one of those things I can't WAIT for her to open. Those are the bestest gifts. ROFL! 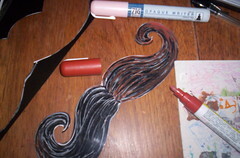 People at work went nuts drawing 'staches on their fingers at work one day. They snapped a ton of pictures too. If I recall correctly a stuffed monkey also sported a post-it note mustache at happy hour that day. Fantastic idea and I bet your sister will get a big kick out of it!